CPR Sump Inlet Assemblies allow aquarists to add a pre-filter bag to a sump with ease. Each unit includes an 8" long PVC drain line adapter (1"ID slip), a 200 micron pre-filter bag and an acrylic holder. 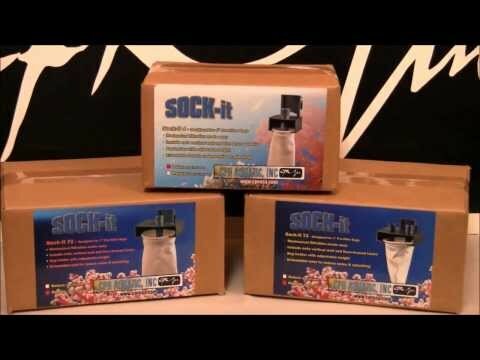 The drain line adapter reduces splashing water and related noises when entering the sump while still making the sock easy to remove and rinse out. The pre-filter bag filters out larger particulate matter before reaching the sump filtration stages while the holder encloses the sock opening on three sides to further minimize splashing out of the sump. Each acrylic holder can accommodate rim sizes up to 1 1/4" wide and are available for 4 and 7 inch filter socks. * Dimensions (L x W x H): 8.5" x 8.5" x 2.5"